A new type of enumeration known as C++11 scoped enumeration is introduced. This type of enumeration is also known as strong enumeration or classes enumeration because it require mentioning of ‘struct’ or ‘class’ explicitly before the enumeration name. 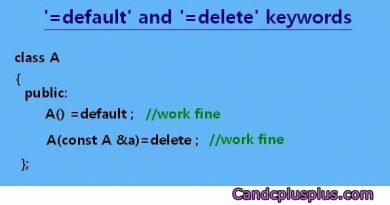 It has lots of advantages over the C type enumeration. In fact, scoped enumeration was introduced to fill the gap existing in the C type enumeration. In this post we will discuss all the properties exhibited by the scoped enumeration. While defining scoped enumeration it is required that we mentioned the keyword ‘class‘ or ‘struct‘ to signify that the enumeration is a scoped enum type. If we look at the C type enum, the keyword ‘class’ or ‘struct’ is not required. This is one of the changes made in the scoped enumeration. In C type enum, we can directly access the enumerators of the enum by just using their names. But in the scoped enumeration we require the scope resolution(::) operator to use the enumerators. The scope resolution operator binds the enum name and the enumerator name. In the scoped enumeration we can explicitly define the underlying type of the enum class. This means, we can define the type of the enumerators explicitly. To do this we use the colon(:) sign and append the data type to the enum name. Consider the code below. Defining the enumerators type explicitly doesn’t mean the enumerators can hold the literals of that type. They can hold only constant integer value. Also note we cannot make the underlying type a floating point type or a string type. So how does declaring the underlying type explicitly affect the enum class or the enumerators? When we define the underlying type explicitly we are making the size of the enumerators limit to the size of that type. By default the enumerators will have the size of int type. But if we define the enumerator’s type as say a char type then the enumerators will have the size of the char type i.e. 1 byte. So defining the type explicitly affect the size of the enumerators. Since the size of enumerators is limited by the type explicitly mentioned, the range of values the enumerators can hold is also limited to the size of that type. For instance, in the enum class having it’s underlying type as char type, the enumerators cannot hold the value 128 or any value greater then 128, because 128 cannot be represented by 7 bits binary digit -the leftmost bit is reserved for the ‘+‘ or ‘–‘ sign. 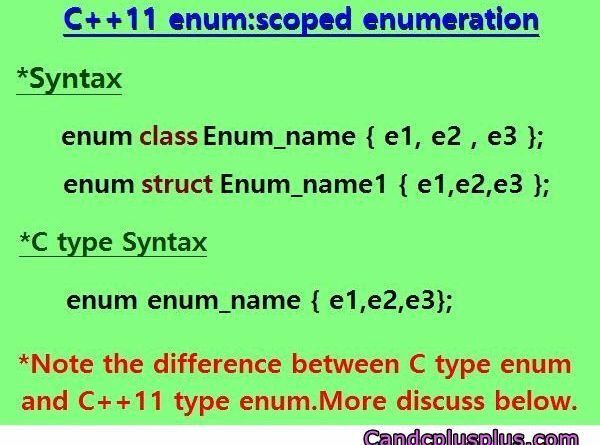 In C type enum we cannot make the name of the enumerators of different enumeration have the same name. But in the scoped enumeration we can. Compiler permits only the enumerators to have the same name, we cannot make the name of the enumeration class similar. The C type enumeration allows implicit conversion of enumerators to int type. This means we can assign enumerators value to int type variable. But in the scoped enumeration implicit conversion to and from int is not allowed. Consider the code below. The scoped enumeration is more cautious of how the enumerators are used, and so implicit conversion is not allowed. Implicit conversion to and from int is not allowed so how do we use the enumerators in our program, the next section explains it. Suppose we want to use the enumerators of the scoped enumeration to perform certain operations. Say you want to assign the enumerators value to another int variable. In such case, the only way that will allow us to achieve the task is to cast the enumerators to int type. In ‘property 5’ we have seen that an implicit conversion to and from int is not allowed, so we will perform an explicit casting using static_cast. And one other thing that scoped enumeration does not allow is outputting the enumerator’s value to the console screen. In such case also performing static_cast on the enumerator will solve the problem. The scoped enumeration allow forward declaration of enum classes. The term ‘forward declaration‘ refer to the declaration of enumeration class without the enumerators. In C type forward declaration is allowed but we must define the underlying type of the enumeration explicitly. In the scoped enumeration, we need not explicitly define the type to forward declare the enum class because the underlying type will be implicitly declared as int type; the compiler does this for us. The enumeration can be declared as a member of any class. Sometimes when we require a ‘const int’ type member in a class and instead of using the normal ‘const int’ variable we can use the enum. And thus the enumerators will act as the constant data member.